The Sanitarium Weet-Bix Kids TRYathlon is designed for Kiwi kids aged 7-15 years to help them stay active and healthy through a programme of participation. The series has been running since 1992 and is a rite of passage for Kiwi kids, to date over 300,000 Kiwi kids have given it a TRY. 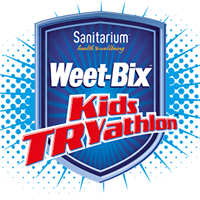 Open to Kiwi kids of all sporting abilities the Sanitarium Weet-Bix Kids TRYathlon is a fun day out for kids, parents and families. Participants get to swim, cycle, and run their way around age appropriate courses, either as an individual or as part of a team of two.